I heard the Sonata in B Minor from this collection last week (11/05/12-11/09/12) on KUSC-FM while driving. The combination of Janet See's Traverse Flute and Davitt Moroney's Harpsichord (along with Mary Springfels Viola da Gamba) is excellent in my book! Perfect for playing at work (and helping me get work done)! 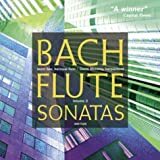 I do realize that some reviewers have rated this disc lower, but for me it's an easy decision: I rate Bach: Flute Sonatas, Vol.1 - Five stars! 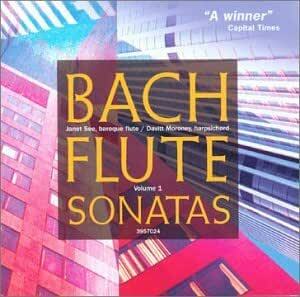 Johann Sebastian Bach (1685 – 1750): Complete Flute Sonatas, Vol. 1: BWV 1034, 1035, 1032, 1030. Performed by Janet See, baroque transverse flute, Davitt Moroney, harpsichord, and Mary Springfels, viola da gamba. Recorded in March, 1990, by Skywalker Sound, Nicasio, California. Harmonia Mundi. Originally released on HMU 907024, now re-released as part of the budget-priced Classical Express series as HMCX 3957024. Total time: 56’24”. Prior to purchasing this disc, I had listened to the same program as performed by Jed Wentz and Christiane Wuyts on Vanguard Classics, but the over-fast tempi and none-too-brilliant sound had deterred me from a closer acquaintance with this music. Janet See and Davitt Moroney, however, have changed all that: Their performance (with the able assistance of Mary Springfels on BWV 1034 and 1035) is absolutely first-class, fully meriting the rave review in the “Capital Times” quoted on the cover: “A wickedly charming set of flute sonatas … See’s wooden transverse flut has a deeper, richer and softer sound than the modern metal flute, but it’s really her bold phrasing and propulsive tempos which make this set such a winner.” Davitt Moroney, thorough musicologist that he is, provides ample notes covering the historical background, including the thorny questions of authenticity associated with most of Bach’s works for flute. The recorded sound is absolutely bewitching, so that listening in front of loudspeakers rather than over headphones is a must. All three musicians play as Bach surely intended: with grace and nobility, but also with fervour and a grand sense of the whole being more than its parts. Congratulations all round on this performance, also to the folk at Harmonia Mundi for making this available at an extremely affordable price! Don't let the budget label and price fool you - these recordings are quality Bach performances. The rich sound of Janet See's tone immediately captivates your senses and is enhanced nicely by a perfectly-resonant recording ambiance (not too close, not too distant). Her Baroque transverse flute exudes a deeper, more "earthy" timbre compared to the brighter one of the modern flute and is most attractive and soothing to hear. Indeed, for this reason, many enjoy these pieces late at night. David Moroney is a world-renown harpsichordist who gives Ms. See an attractive and perfectly flowing background. Bach's flute sonatas have always been some of his more enchanting compositions and this duo brings out such wonderous depth with ever-so-smooth lyricism and poise. Represented on this disc are four of the six sonatas: E major, E minor, A major and the B minor (BWV 1034, 1035, 1032 and 1030 respectively). Volume II rounds out the six with some other works for solo flute. Another even more recommended Baroque flute set is from Ashley Solomon (Channel Classics) or a modern-instrument version by William Bennett on a budget re-issue. Cannot recommend Lisa Beznosiak's set on Hyperion due to a lacking sound balance and overly resonant quality. I was expecting so much more based on the preceding reviews... but this disk (and the second volume) fall short. Don't know whether it's the Folkers & Powell flute or Janet See's technique, but the high notes squeak and overall it sounds as if it's one long battle with intonation. The dry acoustic doesn't help. I have Lisa Beznosiuk, Frans Brüggen, and Stephen Preston on traverso and they sound gorgeous.